Hemakunta Hill is an ancient fortified region from Viayanagara and Pre-Vijayanagara period. It was was once secured with surrounding walls and gateways. The Hemakunta Hill temples in Hampi consist of a large number of temples located on a rocky and uneven terrain. Once we exit the Virupaksha temple and take an immediate right, one can see the flight of steps leading to the Hemakunta hill temples in Hampi. 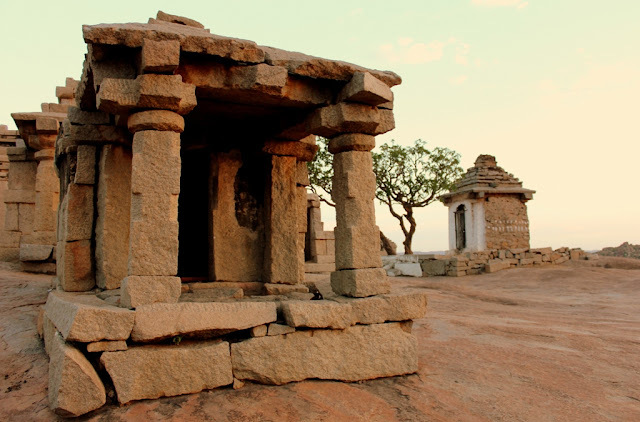 These temples are a must see attraction during the Hampi tour. Hemakunta hill has an interesting story associated with it. A local girl named Pampa, fell in love with the snake clad, ash covered sage doing penance on the hill. His name was Shiva, the most ferocious of the holy trinity accounted by the Vedic scriptures. Shiva initially decided to ignore the romantic advances by Pampa but story did have a happy ending as Shiva married Pampa, thus making her the Pampa Devi. myth says it rained gold at the hill during this glorious occasion. 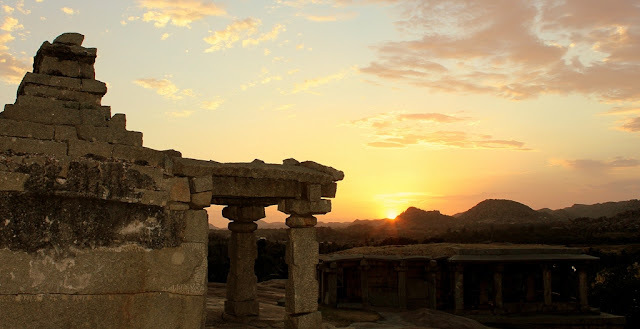 Hence the hill was named Hema-Kunta meaning the “Bowl of Gold” in Sanskrit.While doing a Hampi tour, it is great to understand these legends, which will make the visit worthwhile. On the granite slopes of the Hemakunta hill, around 35 ancient temples are located. There are a few structures which deserves a special mention. One of them is a north facing temple with pyramidal roof which reminds us of the Jain architecture. An inscribed slab in this temple mentions that it was built by Kampila in the 14th century. 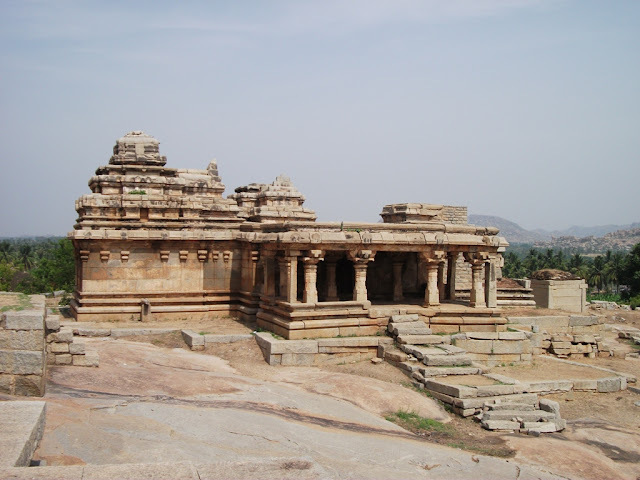 Kampila is the predecessor of the Vijayanagara rulers who was the king of a small kingdom in the Thungabadra valley till 1327. It is one of the oldest Hampi temples. 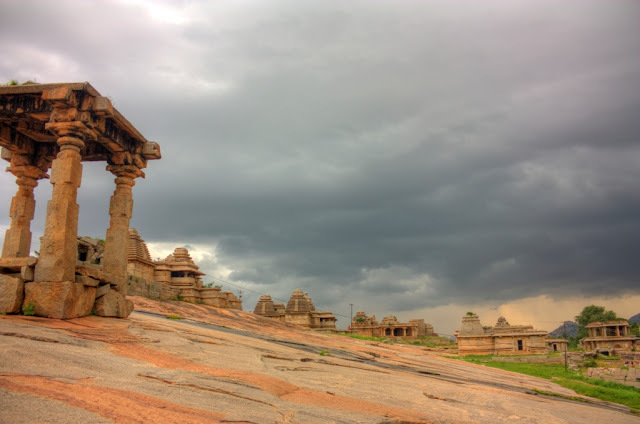 Most of the Hampi temples in the Hemakunta hill houses Shiva in Linga form as their deity, which has made the experts believe that it was a fortified complex which was built in the Shyva religious cult. The original Virupaksha temple ( the core / “Moola Virupaksha”) is believed to be located at the Hemakunta hill. 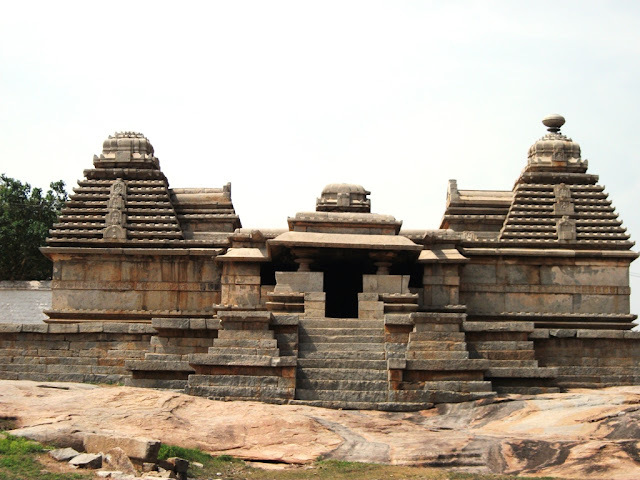 Experts suggests that there was a stone path that connected this core VIrupaksha temple with the present day Virupaksha temple. The path started at the summit of the Hill, passed through multiple gateways, passed through the Manmatha tank and ended in the Virupaksha temple. However, as Krishnadevaraya renovated the present day Virupaksha temple, this path was cut off. However, The reminiscent of these gateways still exist. From the above gateway, one can have a breath taking view of the Thungabadra valley, especially during the sun rise and the sun set. A temple in Hampi that houses the Sasivekalu Ganesha sculpture is located near the Hemakunta group of temples. Sasive(ಸಾಸಿವೆ) in Kannada means mustard seed and it appears that the Ganesha statue resemble a mustard seed made of stone! The 2.4 meters high statue is placed under a roof, supported by pillars with a relatively simple carvings. The myth behind this statue goes like this - Lord Ganesha is a complete foodie and once he ate too much of Modaka(a kind of sweet rice cake) and he was afraid that his tummy would burst! ( Happens with any foodie. Right? ) . The cute Ganesha was not short of ideas to save his tummy, so he took a snake that passed by and tied it around his waist. Tada! The problem solved. 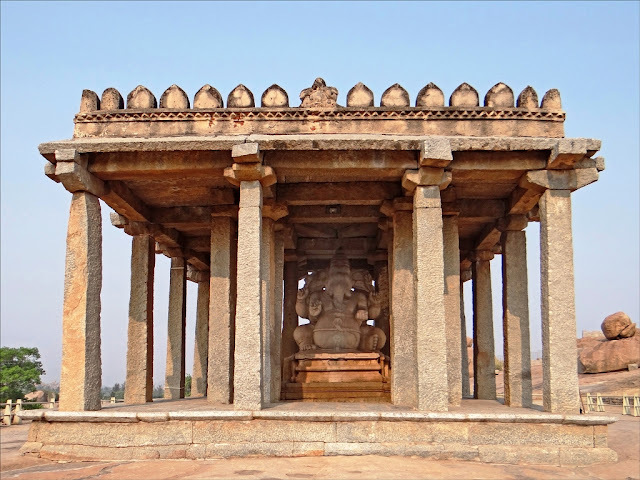 Another temple in Hampi worth visiting near the Hemakunta hills is the Kadalekalu Ganesha temple. The person who had named these sculptures must have had a great imagination for, Kadale in Kannada means “Bengal gram”. The idol is not directly visible from outside, as the inner sanctum is covered by a pillared Mantapa (Hall) in front of it. There are 24 pillars which look extremely slender and grim without any curves. As we enter through the Mantapa and walk towards the inner sanctum, we can see a 4.5 feet Ganesha idol, which is carved out of single, natural boulder. 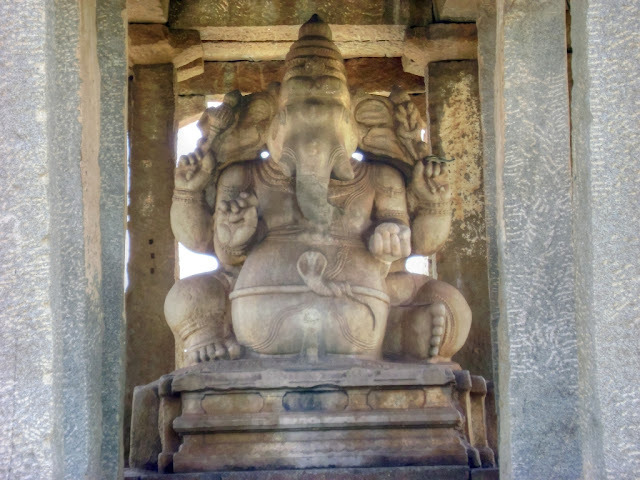 Like the mustard seed shaped Ganesha statue(Sasivekalu Ganesh), the idol in the Kadalekalu Ganesh also had a huge round tummy. However, this time Ganesha seemed to be careful about how much he ate, as his tummy looked perfectly fine. However, on a close observation, we can see that the trunk of Ganesha is reaching towards the Modak (the sweet rice cake) in his left hand, suggesting that his meal is not yet over.